Lasco Manufacturing Limited (LASM), for the nine months ended December 31, 2017 reported total revenue decreased by 3% from $5.42 billion in 2016 to $5.28 billion in 2017. Revenue increased $316.65 million or 22% to a total of $1.78 billion in the third quarter, relative to the $1.46 billion recorded for the comparable period in 2016. Cost of sales amounted to $3.61 billion (2016: $3.59 billion) for the period, an increase of 1% year on year. For the third quarter, cost of sales was recorded at $1.22 billion in 2017 relative to 960,842 million in 2016. As a result, gross profit of $1.66 billion was recorded for the period, 9% less than the $1.83 billion booked for the corresponding period in 2016. Gross profit for the third quarter increased by 12% to $561.12 million when compared to the $503.05 million booked for the quarter ended December 3, 2016. LASM posted other income of $14.76 million relative to $18.68 million for the prior year. Operating expenses increased 5% to close the period at $970.31 million versus $920.35 million booked for the corresponding period last year. Expenses for the quarter reflected a decline of 10% to close at $300.61 million (2016: $335.20 million). The company stated that the reduction in operating expenses during the quarter “reflected the effects of improved controls”. 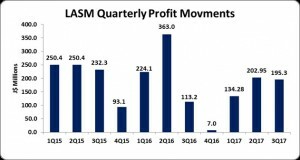 Consequently, LASM recorded operating profits of $707.85 million, 23% lower than the $924.97 million booked in 2016. Finance costs for the period fell 22% to $99.26 million compared to $126.48 million in the prior year’s comparable period. As such, profit before taxation amounted to $608.59 million, a decrease of 24% from the $798.49 million recorded for the previous corresponding period. Taxes recorded for the period amounted to $76.07 million compared to $98.24 million incurred for the corresponding period in 2016. For the third quarter, profit before tax increased $93.84 million or 73% to $223.19 million. As such Total Comprehensive Income for the first nine months totaled $532.52 million compared to $700.25 million in 2016, a contraction of 24%. Total Comprehensive Income for the quarter totaled $195.29 million (2016: $113.18 million). Consequently, earnings per share (EPS) for the period amounted to $0.13 relative to $0.17 in 2016. The EPS for the quarter amounted to $0.05 relative to $0.03 reported for 2016. The twelve months trailing EPS amounts to $0.13. The number of shares used in the calculations amounted to 4,087,130,170 units. LASM also introduced a new juice drink “Guava Juice” adding to their existing portfolio and will launch a variety of carbonated beverages and an energy drink in the upcoming quarter. Total assets increased 8% year on year, totaling $8.05 billion (2016: $7.48 billion) as at December 31, 2017. The increase in total assets over the period was mainly due to a $334.89 million increase in ‘property, plant & equipment’ to a total of $4.12 billion (2016: $3.78 million) and a $328.31 million increase in ‘trade and other receivables’ to $2.26 billion (2016: $1.93 billion). Total shareholder equity amounted to $4.84 billion as at December 31, 2017 (2016: $4.43 billion). Consequently, book value per share amounted to $1.18 relative to $1.08 in 2016.